The guys weren't the only ones who wanted to talk about the Kimbrel trade. That led to Hatfield making appearances on Barstool Sports' Section 10 Podcast with Jared Carrabis and Pete Blackburn and Bangor, Maine's Downtown with Rich Kimball, among other appearances. November 20 was the date that prospects needed to be added to the 40-man roster to be protected from the Rule 5 draft, which will take place on December 10 at the Winter Meetings. The morning of the 20th, Hatfield detailed the eligible players and made predictions of players who were likely to be protected, who may be protected, and who were unlikely to be protected. He also touched on the impact that the Kimbrel trade had on this process. Margot was certain to be added to the 40-man roster in advance of the deadline but instead was replaced on the 40-man by the newly acquired Kimbrel. Turns out Hatfield was spot on and the team announced later in the day that they added both players Hatfield listed as likely to be protected, right-handed pitcher Pat Light and infielder Marco Hernandez, as well as the only player he listed under the 'may be protected' category, lefty Williams Jerez. Senior staff writer James Dunne summarized the additions after they were announced. 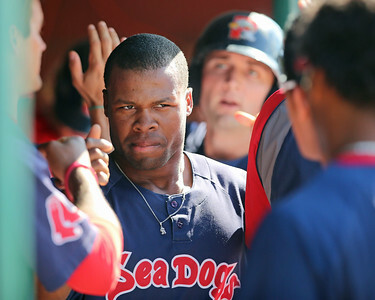 The Kimbrel trade also impacted the SoxProspects.com Season-in-Review series as all four players traded were due to be profiled. We made the decision to include them despite the fact they are no longer with the organization. The two most recent editions had players that were affected by off-season moves, including Wednesday's edition which includes Asuaje. Monday's version was also affected when news broke that right-hander Dayan Diaz was signed by Cincinnati as a minor league free agent. Catch up on the entire Season-in-Review series here. Red Sox prospects continued to play in various winter leagues, and the Fall/Winter League Roundup weekly series continued throughout November. This month's editions included November 2, November 9, November 16, November 23, and November 30. You can also check out the stats from every Red Sox prospect playing in a winter league on Fall & Winter League page. The Kimbrel trade was such big news that there was no way we would be the only ones discussing it. Most industry writers, both local and national, seemed to agree that while Kimbrel is a great addition to the Red Sox team, they gave up a lot for him. The list of those that believe they overpaid included Keith Law of ESPN (Insider required), Ryan Hannable at WEEI.com, Ben Buchanan with Over the Monster, and some others as well. Chris Mitchell at FanGraphs went with a slightly different approach. He took the analytical approach in projecting the future value of the prospects traded for Kimbrel. The other consensus they all seemed to agree on is that while it may have been an overpay, the Red Sox managed to avoid dealing any of their top tier prospects such as second basemen Yoan Moncada, third basemen Rafael Devers, center fielder Andrew Benintendi, or righty Anderson Espinoza. This is all the more relevant with the news that the Red Sox got their much needed front end starter through free agency rather than via a trade. That is closer to the perspective Tim Britton takes for the Providence Journal in his post on the trade. In anther piece, Britton speaks with Darren Fenster, the manager of the Single-A Greenville Drive, who managed the two headliners of the deal. The David Price signing is generally out of our area of focus, but the one thing to note is that he was ineligible to receive a qualifying offer this winter and, therefore, his signing does not cost the Red Sox their first round pick in the 2016 draft. Some believe that Benintendi (pictured, left) may fly through the system, at least in part due to his experience in a good Division 1 college program. Brian MacPherson of the Providence Journal speaks with some about how that could happen and compares the situation to that of Mets outfielder Michael Conforto. Catcher Christian Vazquez continues his recovery from Tommy John surgery this spring. His road back hit a snag when his winter ball team folded. While he was able to find a new team, WEEI's John Tomase reports that due to the time off and other circumstances Vazquez may not be 100% for spring training. I do not believe this to be unexpected and believe the most likely scenario has Vazquez starting 2016 at Triple-A, and that is reflected in the SoxProspects.com 2016 projected rosters. Fellow catcher and former top prospect Blake Swihart should open the year as the Red Sox starting catcher. MacPherson writes that the Red Sox brass believe that Swihart should keep improving on what is already an impressive skillset. Coming off a season where he hit .307/.381/.452, first baseman Sam Travis has risen to seventh in the SoxProspects.com rankings. Others are taking notice as well and MLB.com's Bernie Pleskoff dives into his scouting profile. When asked to describe him in one word, Pleskoff says "contact". Travis Shaw was playing in the Puerto Rican winter leagues with the hope of getting some reps in at third base in addition to his typical first base. That plan was cut short early in November when he reported shoulder discomfort and was shut down as Scott Lauber writes for the Boston Herald. At this time, the injury is not believed to impact his ability to be ready for spring training. After spending most of his prospect career as a starting pitcher, right-hander Matt Barnes has been informed by Dave Dombrowski that he will be moved to the bullpen as Dombrowski told WEEI's Hot Stove Show earlier in November. Michael Bowden has signed with the Doosan Bears of the KBO. Lefty Rich Hill signed with the Oakland Athletics on a one-year deal for $6 million as Yahoo's Jeff Passan first reported. ESPN's Adam Rubin reported that righty Stolmy Pimentel, who last pitched for the Red Sox organization in 2012, was signed to a minor league deal by the New York Mets. Catcher Humberto Quintero, who played for Pawtucket in 2015, signed a minor-league deal with the Blue Jays as Shi Davidi of Sportsnet repored. Former Red Sox right-hander Gabe Speier was traded from the Tigers to the Braves for outfielder Cameron Maybin. Speier was traded by the Red Sox to detroit as part of the Rick Porcello deal. Though he has not signed on with a team, Peter Gammons wrote that outfielder Ryan Kalish has begun his comback attempt this winter in Puerto Rico. He has not played since 2014 with the Cubs. The Lowell Spinners announced that they have extended their affiliation with the Red Sox through 2018. They will continue to act as the organization's New York-Penn League representative. The Salem Red Sox announced on Tuesday that they have promoted Ryan Shelton to President of the club. Shelton previously acted as the team's General Manager, a position he took over in August of 2015. Shelton also one this year's Calvin Falwell Executive of the Year Award in the Carolina League. Photo Credit: Manuel Margot and Andrew Benintendi by Kelly O'Connor. Will Woodward is a Senior Staff Writer for SoxProspects.com. Give him a follow on Twitter @SPWill.